Maybe you bought a new Berber carpet and want to know the best way to clean it. Or, maybe you learned the hard way that every vacuum doesn’t work for Berber (hopefully not). But what is Berber? If you go way back, Berber was a tribe in Africa. And this isn’t just a random fact. This ancient tribe created a specific weave for rugs. This weave was so popular that it was named after the tribe, and you still find it in carpet today. Now that Berber is much more common, you can take its unique weave for granite. But it never goes out of style. The loop style of Berber can make it a durable carpet. This is why you’ll sometimes see looped carpets in commercial buildings and schools. But there’s one thing Berber doesn’t hold up well against: vacuums. And that’s the point of this article. How can you vacuum your Berber to get it the cleanest without ruining it? We know certain features make vacuums stand out: suction power, ability to pick up different things (dust, animal hair, long hair, food crumbs, etc) easy to maneuver, easy to empty and perform maintenance, useful tools, and adaptive features such as a controllable brush roll and vacuum height. The last part is important for anyone’s vacuum but critical for Berber owner’s. This is where my vacuum research started. If the vacuum isn’t adaptive, it was thrown out. If it was, it was in consideration for the best vacuum for Berber. 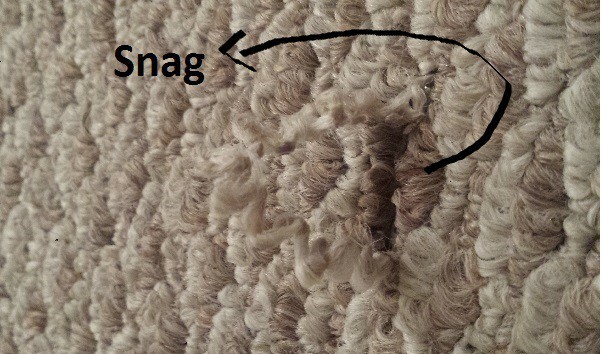 Those beautiful loops designed by an ancient African tribe can get snagged by vacuums. The problem is the beater bar. Depending on the design of the beater bar and the height of it, the bristles can grip one of the loops and rip it. There are ways to repair ripped loops, but it’s definitely a headache. Not to mention, once it rips it can continue to unravel like a loose thread on your close. So don’t pull at it! While the first may sound like a joke, many people vacuum their Berber carpet with the beater bar on the vacuum with no problem. In fact, that picture came from a test carpet. Although it clearly ended up snagging, this was after many tests. My rule of thumb is I would turn off the vacuum the majority of the time. If you want to do an occasional clean with the beater bar on, go for it. Just know there is some risk of a snag. The second you get a snag, stop the vacuum and repair the snag. And consider that your test, I wouldn’t use the beater bar (or raise the height) because otherwise it will almost definitely happen again. Having a vacuum you love takes a lot of headache and pain out of your life. For Berber, loving your vacuum means it does two things: cleans your carpet but also doesn’t snag it. These 3 vacuums all should do an excellent job depending on your needs. Any questions on vacuums and Berber carpet? Let me know in the comments below. The house I moved into already had berber. As I recall it was lighter in color. It seems now to be darker.. I take good care of my carpet and have runners in high traffic areas. Does the light color berber darken with age? That hasn’t been my experience unless it gets oily. Oil attracts dirt like static and this can give carpet a darker look. Often when carpet is professionally cleaned, mid-clean you can see a lighter (clean) and darker half. This could be the issue. Than the vacuum should work good for maintenance cleaning.